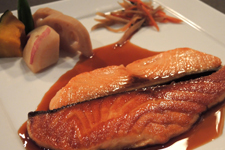 Pan seared salmon with salt or teriya­ki sauce (mirin, sake & soy). Assort­ed sea­son­al veg­eta­bles, tofu & clear noo­dles sim­mered in a sweet Japan­ese broth. Served with organ­ic sal­ad, miso soup and rice.